Forever etched in the minds and traditions of millions of Americans, July 4th is undoubtedly THE historical turning point, a date which marked both the symbolic ending of British supremacy and the beginning of a new nation. It is, therefore, not surprising that the celebrations associated with July 4th are most often of a grandiose scale. To help you prepare for such a great celebration, we have put together a selection of products which could contribute to the festive atmosphere. 12 pairs of patriotic sunglasses mean that you, your family and perhaps a good part of your close friends are covered (yes, pun intended). 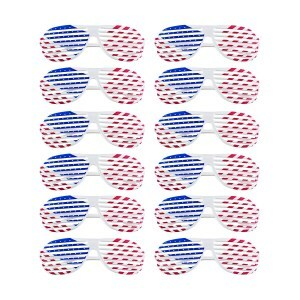 Of course, it is most recommended to wear these glasses at your 4th of July barbecue or local parade; that doesn’t mean, however, that you can’t wear them in other places or for no special reason. They depict the American flag on each lens and the material used is a lightweight plastic, that does not alter vision. The product measures 6 inches across the frames, and it fits perfectly, whether you’re a boy or a girl. Want to celebrate your 4th of July in style? Then this party pack is exactly what you need, when it comes to the food part. The 50-guest capacity of the product ensures that no one is left aside and, unless the number of guests is precisely 50, may even mean that you’re left with extra plates and napkins. The dinner plates come in a 9-inch size, while the dessert plates come in a 7-inch size. The napkins are 6.5 X 6.5-inch square. Once you purchase this pack, you’re in for a good time with your guests, no matter the occasion. Decorating one’s home with patriotic themes just got more interesting, thanks to this innovative product. 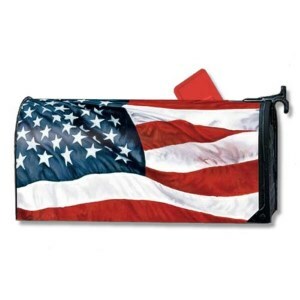 Specially designed to fit most standard size metal mailboxes, which normally are 6.5 inches wide and 19 inches long. The product adheres to the mailbox thanks to the two strong strips, which are magnetic. It also comes with three sets of self-adhesive numbers, included so that the beauty of the American flag remains untouched and in harmony with said numbers. To ensure its long-lasting beauty, the manufacturer opted for a vinyl coating and screen printed the cover, which looks even better in real life. A beautiful little item to have, especially if you’re a parent, is this baby girl toddler romper. A must-have for the 4th of July celebrations or even other occasions, such as, for instance, a photo prop or a 4th of July Pageant contest. The romper is perfect for wearing during the summer, being made from fabric that is soft to the baby’s skin and can stretch, somewhat. As a bonus, if you purchase this jumpsuit you get a free headband, also adorned with the American flag and that would complete a great look for the Independence Day festivities. 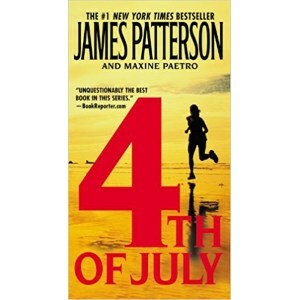 If it’s too hot outside or a storm prevents you from having fun on July 4th, don’t despair: authors James Patterson and Maxine Paetro joined forces so that you can enjoy a thrilling and full of suspense novel in the relaxing comfort of the indoors. Heroine policewoman Lindsay Boxer is facing a trial for her conduct during a deadly late-night firefight; taking advantage of a trial break, she arrives in a beautiful town where a series of gruesome murders echo a case she faced during her rookie years. Thankfully, her friends in the Women’s Murder Club are there for her. 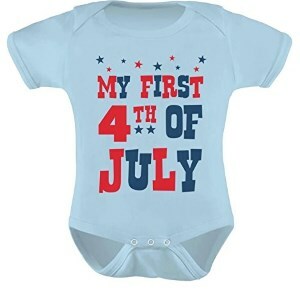 Echoing the cuteness levels of the babygirl romper above is this baby bodysuit, particularly designed for the 4th of July celebrations. 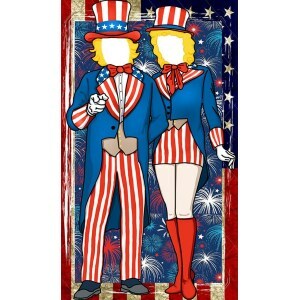 The colors chosen are those present on the American flag, and the bodysuit is suitable for boys as well as for girls. It features short sleeves and is made from 100% preshrunk combed cotton, a type of fabric that is, of course, machine washable. It comes in various sizes and colors, with shoulders that are overlapping and expandable and a three-snap closure in the lower part, to make changing smooth and easy. The details and lettering are very clean and neat. A perfect accessory to have if you’re into house parties, be they outdoor or indoor, is this two-pack banner. 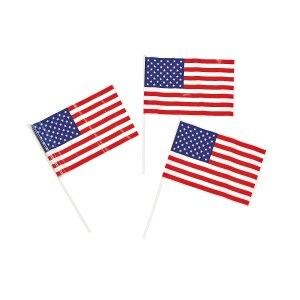 The material is a lightweight plastic and the two designs the product includes are alternating: stripes of red and white colors and a blue background with white stars on it. The measure for each banner is 12 inches long, and the quality of the product is really outstanding, both in terms of detail and richness of the colors used. No Independence Day party is complete without a truly patriotic banner, so keep that in mind when the festivities approach, will ya? Now here’s a cool and funny prop you can actually use and laugh about for years to come. With the banner measuring approximately 39.4 inches in width and 70.9 inches in height, this can be the perfect idea for an Independence Day-themed photo booth. Taking pictures with your significant other or your family has never been more fun and entertaining. Carefully crafted, the product is made out of long-lasting color and material that is non-deformable and waterproof. Just don’t forget to remove package before using and air the backdrop, so that it doesn’t smell on the big day. A staple of any successful Independence or Memorial Day celebration, this 72 American flag pack is guaranteed to bring your guests together in love for the red, white and blue. Hand them out at a barbecue, as they are conveniently placed atop a plastic stick; put them on your fancy hat, in a bowl of cookies, your car, wherever you wish and wherever they look good and appropriate. 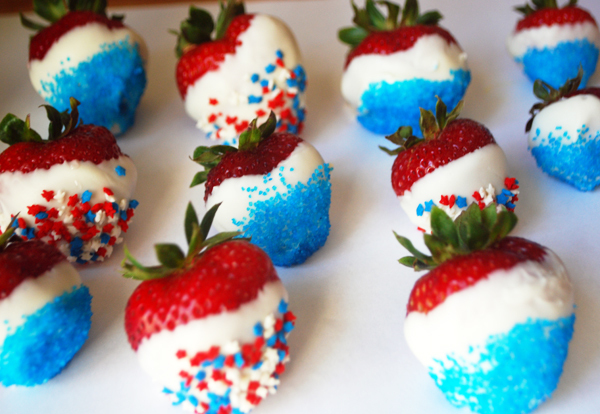 Take them with you at an Independence Day parade for waving, use them in jars filled with red, white and blue rice, made for the veterans, plenty of options and occasions! Real American patriots will stop at (almost) nothing to prove their commitment and love on Independence Day. 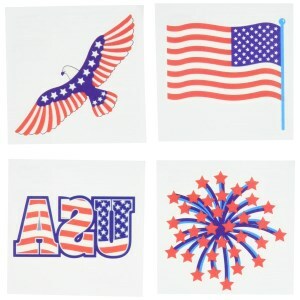 This is why this pack of 24 temporary tattoos will suit them perfectly, especially during a 4th of July parade. Measuring 4 X 4 inches, the tattoos are made out of paper and non-toxic tattoo ink, which makes them great for use for all age ranges. The pack features four designs, which come in conveniently individually wrapped smaller packs; among the designs, of particular interest to any potential buyer would be the star-spangled eagle in flight or the spectacular exploding fireworks display. If earlier on we had a book entitled “4th of July” in our list, the final item we present you is no more, no less than a CD with patriotic music. 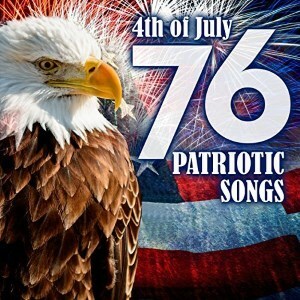 With it bearing the title “76 patriotic songs: 4th of July & Memorial Day”, one can easily spot the reference to the year 1776, when the Declaration of Independence was signed. You won’t find any renowned artist on this CD, which doesn’t make it any less of a good listen. Most of these songs are performed by “Faith & Justice” and “The President’s Own The United States Marine Band”. With summer just around the corner, spending long working hours in cubicles doesn’t seem like a fun activity. It’s time for weekends in the Hamptons for the wealthy ones, endless beach parties, fun and flirty clothes and long nights spent on pontoons with beer kegs and your best buddies. 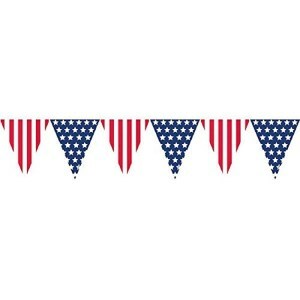 No matter how you choose to spend this summer, one thing is for sure – you will be certainly requiring some cool decoration stuff for summer’s most popular celebration – 4th of July. 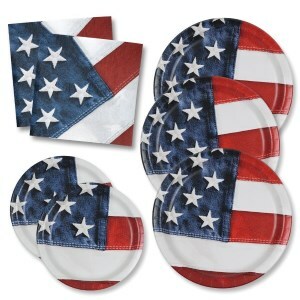 But finding the coolest stuff for a patriotic celebration is no easy job. Yes, there are literally countless options on the market to choose from, but most of them are cheap, cheesy and kitsch. If you do not want to fall into this category but still want to proudly show your American ancestry, you will need to know what to look for. We have compiled a comprehensive buying guide complete with tips and tricks on the coolest items available for purchase right now, as well as with some things to take into consideration if you want to make the most out of this holiday. We guarantee you will be the soul of the party and envied by everyone. There are numerous websites providing everything you need for a cool 4th of July party, but how do you know you made the right choices? We suggest you get a little organized and follow some simple rules and tips, depending on the types of accessories or stuff you might need. Although it’s midsummer and there is still a lot to wait until Halloween, the idea of wearing a costume on the National Day may prove winning. There are numerous historical disguises you could choose from, including the Founding Fathers ones or the old Abe Lincoln. Uncle Sam and the Statue of the Liberty, alongside Betsy Ross are other notorious American figures worth wearing as an inspiration and a constant remember that the United States wouldn’t be now reality without their sacrifices. Except for Uncle Sam. He’s just cool. The great part is that you will definitely fit perfectly into the costume you choose to wear as there are plenty of sizes available, no matter if you are tall, short, a woman or a man, a child or a plus-sized person. Depending on the size and the age group of your costume, as well as the chosen provider, you will pay anywhere between thirty dollars and a little over fifty. Sure, if you need more complex costumes or custom-made ones you will have to pay extra. If you’re not a big fan of full costumes but still want to show your American pride, you can always opt for a set of accessories that will match your blue/red/white outfit. Accessories range from 4th of July inspired hats, beanies or oversized hats to headbands, necklaces, bracelets, wands, glasses, suspenders, and even tutu skirts. The prices of these sets are also convenient, while the main advantage is that you can choose to combine multiple items or share your accessories with your friends. You can also choose to wear only one 4th of July-inspired garment and match it with the rest of your outfit as you please. Again, no matter your size, height or weight, online providers will match all your requests and help you choose the perfect clothing item for the party of the year. Men can choose from a white array of shirts with different prints, while women can opt for dresses, skirts, and even cool denim shorts. If you’re a fan of Lady Gaga, now is the chance to channel all your styling capacities and put on your best reinterpretation of her iconic 4th of July outfit from 2016. And since there is no party without local famous punches or tons of beer kegs, you will also have to choose themed drinkware to match the occasion. Give the popular red cups a rest and choose fancier items instead. Opt for printed soda bottles to truly feel the patriotic vibe and replace ordinary paper cups with fancier tumblers. They may end up costing a little longer but the good thing is that you get to keep them, wash them and reuse them the following year. Plus, soda bottles with strings will look extra cool in all your Instagram pics. Keep your bottles cold as ice with some patriotic metal buckets. They sell only for a few dollars but they are great storage items and can prove to be quite handy in plenty of situations. You can use them to cool down the summer heat, fill them with delicious punches, store ice, or create ad-hoc funding raisings for different charities. And what better way to keep all the garbage in one place if not by placing a red, blue and white pop-up trash bin? You can buy as many as you want to make sure you keep a clean environment. If you truly want to transform your party venue into an ode to the Founding Fathers, you will definitely require the right decorating kit. Bring on the white, red, and blue paintings and choose other matching items to decorate your porch, pontoon, and beach house ready for the coolest party of the year! A good decorating kit should contain door decorations, bows, pennant banners, garlands, bunting, as well as balloons. You can complete the festive look with some matching paper lanterns and confetti. Don’t forget about the fireworks and you will be ready for the most awesome party of the year, alongside your favorite friends. If you don’t want to spend all your pocket money for paper, non-reusable decorations, you can always stay frugal by wrapping the house in flags and decorative balloons to cheer the atmosphere. 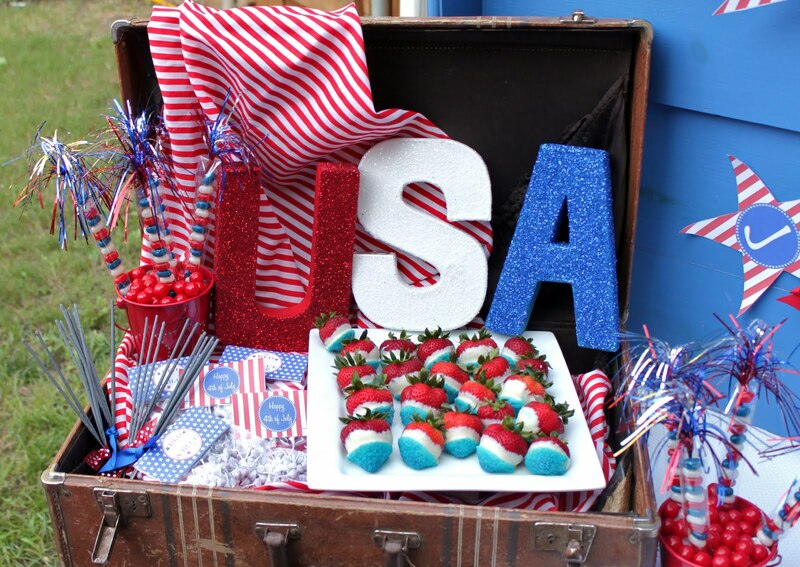 In fact, any type of decorations in the red, white, and blue colors will be considered useful and appropriate for the party, so why not let your imagination flow and choose budget-friendly items or make your own decorations?